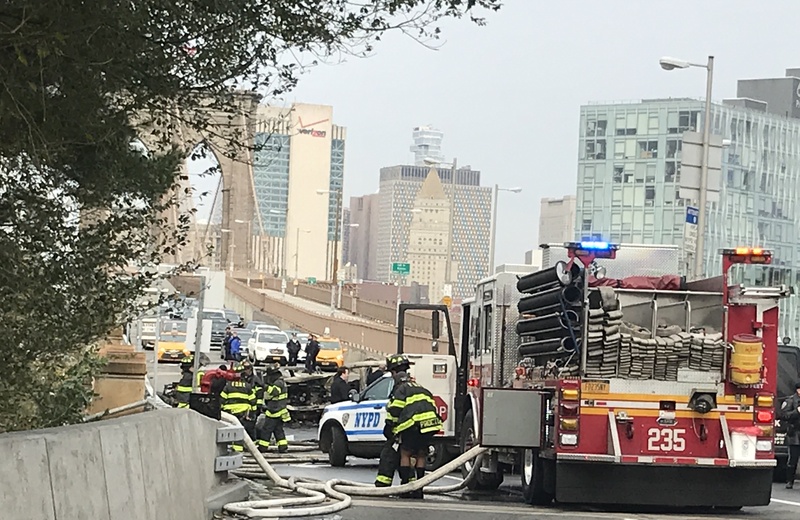 One driver was killed in a fiery multi-car crash this morning on the Brooklyn-bound car lanes of the Brooklyn Bridge that injured five in all, police said. The collision caused at least three of the cars to ignite. FDNY said it put out the blaze within 45 minutes of the 7:15 crash. There may have been as many as four cars involved, WABC7 reported. The crash shut down the span for more than an hour on Wednesday morning, but Manhattan-bound lanes were reopened by 8:45 a.m.
“There is no visible structural damage noted at this time,” said spokesman Brian Zumhagen. The bridge will be inspected once the NYPD reopens the Brooklyn-bound lanes, he added. A dangerous explosion!! We need bollards surrounding the entire bridge, pronto! The irony is if gasoline wasn’t already “grandfathered in”, so to speak, under today’s standards it likely would be banned from common use as a dangerous substance. A lot of things which are far less flammable are much more highly regulated. NYC needs to ban everything except electric vehicles within the next 5 to 10 years. This was a dry run for El Chapo’s escape plan. The bike and pedestrian path was still closed as of 10am even though a NYC DOT spokesman said the path was “not affected”, yet the road lanes were re-opened by 8:45am. There is always an effort to minimize the time motor vehicles lanes are closed but no equal concern for bike and pedestrian lanes. For two days, cops have been in the bike lane on Jay Street. One woman was badly injured and another cyclist was shoved by an officer. Um, what exactly is going on, Mr. Mayor? It's unreasonable to wait years for the promenade to be expanded when the city could repurpose a lane of bridge traffic for bicycling much faster.